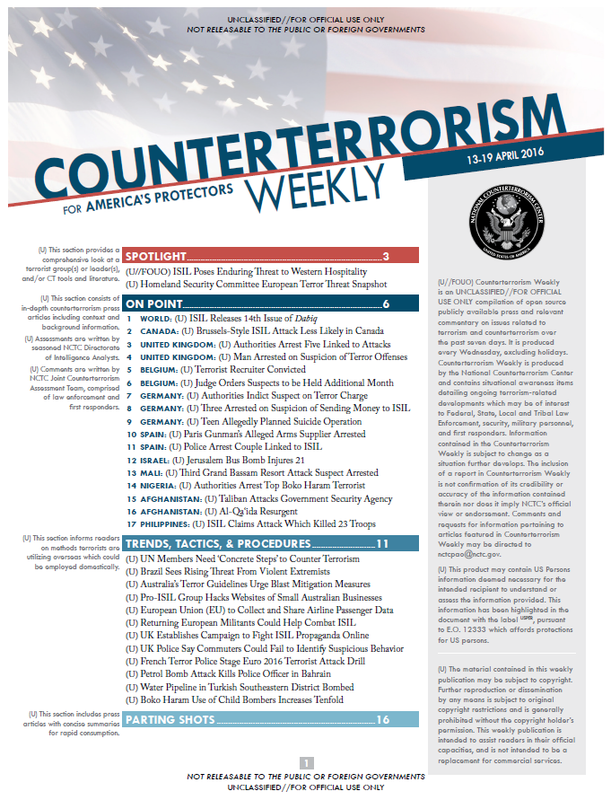 The following are examples of the National Counterterrorism Center's Counterterrorism Weekly publication, a "compilation of open source publicly available press and relevant commentary on issues related to terrorism and counterterrorism over the past seven days." The digests are not released to the public. (U//FOUO) FBI assesses the threat posed by ISIL to hospitality and entertainment businesses frequented by US persons and other Westerners abroad likely will endure in 2016, based on a body of open source reporting. 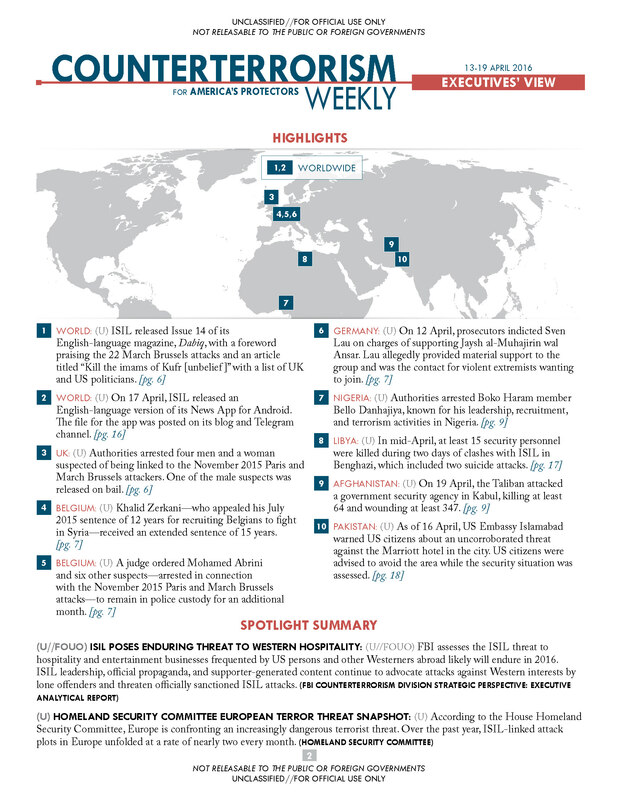 ISIL leadership, official propaganda, and supporter-generated content continue to advocate attacks against Western interests by lone offenders and threaten officially sanctioned ISIL attacks. Other supporters of ISIL have, via various social media sites, called for retaliation against the US and Western interests abroad, especially since US-led airstrikes in Iraq and Syria began in August 2014. (U//FOUO) At least nine ISIL operatives divided into three teams conducted near-simultaneous attacks on 13 November 2015 targeting a stadium, multiple restaurants, and a concert hall in Paris, France, killing at least 130 and wounding at least 352 in less than an hour. The attackers, some of whom were assessed by European services to have traveled to Syria, were equipped with assault rifles and explosive-laden suicide belts, and operated in a manner indicative of prior training. 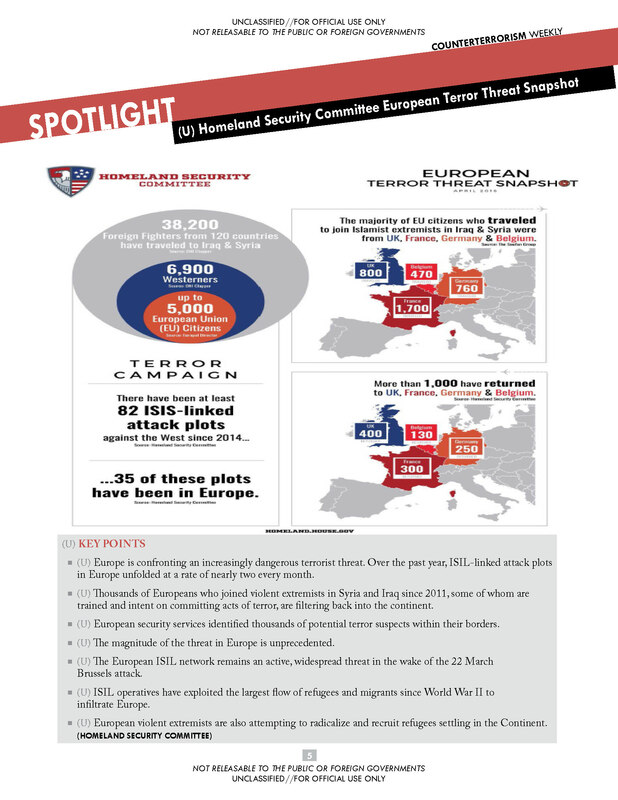 The selection of targets, including an approximately 80,000-person capacity stadium hosting a soccer match between the French and German national teams, a concert venue featuring a US rock band, and restaurant districts, indicate the attackers may have used their local insight to select targets, as all but two of the operatives were French or Belgian citizens. (U//FOUO) A forum participant on 21 September 2014 posted links to an English-language translation of an audio message attributed to Abu-Muhammad al-Adnani, the ISIL spokesman, titled “Indeed Your Lord Is Ever Watchful [Koranic verse, al-Fajr, 89:14].” The message urged lone offenders in the West “in any manner” to kill “soldiers, patrons, and troops…their police, security, and intelligence members.” The message stated potential attackers should “not ask for anyone’s advice” before striking, because such attacks were legitimate.